About Hello, I am Sean Murphy. 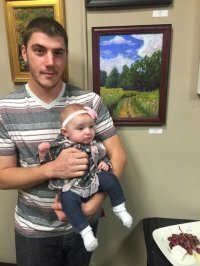 Im a 29 year old artist from bucks county. I like to paint pictures that are a reflection of where I've been and grew up. My medium is pastels. I started working with pastels about a two years ago and haven't been able to stop since. I like to travel, paint plein air and experience the landscape first hand. Some sceneries I enjoy painting are Tyler State Park, North Cape May Bay, Playwicki Park, and more. Art is a talent I will never grow out of that I hope to pass down to my number one fan, my daughter Amelia. In the meantime, I am here to give you something that catches your eye and makes you feel like you were able to be there with me.